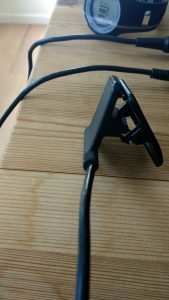 Last week I got home from a run, went to plug in my Garmin and realised that the clip had been knocked onto the floor and was broken! It’s hard to see in the photo but the clip no longer meets as the spring is gone. I managed to hold it together over my watch so my run was uploaded, and then had a look on the internet for a replacement. 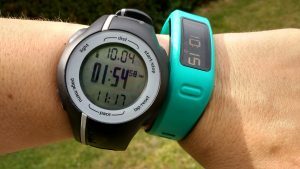 Luckily amazon had a replacement, and although it wasn’t an official Garmin one, it had good reviews, so I gave it a go. 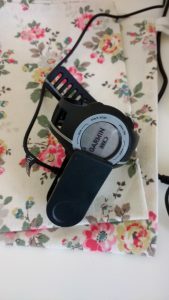 It seems to clip on better, but sometimes I have trouble downloading the runs- it will begin to charge so I know it is attached properly, but Garmin express will say there is nothing connected. But after a bit of fiddling it downloads the runs so that was a relief! After my parkrun pb on Saturday, I realised I had run for 3 days in a row so I had Sunday as a rest day. 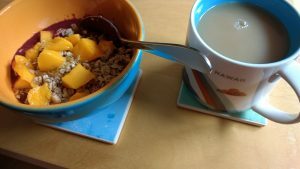 We made an acai bowl for breakfast, and topped it with a mango and some granola- so summery. I made a cake to take over to Andy’s parents (here if you are interested- caramel chocolate bars although I used macadamia nuts instead of hazelnuts), although it was very warm and so it hadn’t set by the time we left to take it over. 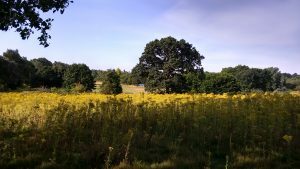 We had a nice walk in the sunshine- probably around 3 miles (trying to match it against some of my running routes), had dinner in the garden and then watched some of the Olympics. A lovely relaxing Sunday. On Monday it was long run time. 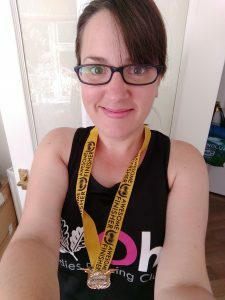 I am doing the Disneyland Paris half marathon at the end of September (so excited!) and we are off on holiday for a couple of weeks, and I don’t think I will manage many (if any) runs. I am taking my running things with me but with a view to wear them if we do some long walks as the shoes grip better. So I wanted to do about 10 miles to keep the long runs fairly long, and then when I get back I’ll have 3 or 4 weekends to get back up to that distance. I’d signed up to a virtual race as it raised money for GOSH, plus it had a very pretty unicorn medal. Before I left, my medal for 100 miles in July came in the post. Of course I had to wear it for a bit. The company that do this seem to do a 100 mile challenge each month. I’ve not signed up for August as I know I won’t do it, but it is a very cool Olympic themed one. However, the September one just popped up and it’s really pretty, with autumn leaves surrounding it. Seeing as I’ll need to be getting my miles up again for the half, I could be tempted…. I had a look on Strava as I had not planned a route. I saw my 9 mile route from a few weeks ago, and knew that if I carried on at the end instead of going through the little alleyway, I could make it up to 10. It was good running weather- sunny but with a strong breeze, which kept it cool but also made it hard work when I was running into the wind. 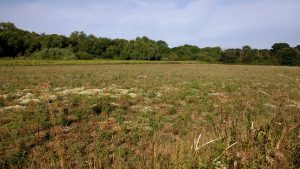 This field still had a lot of poppies in it, although it’s hard to see from the photo. 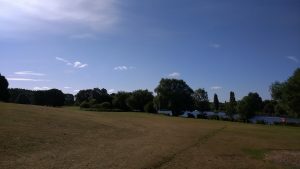 I ran into the park and up the little hill, so treated myself to a little walk at the top while I took a few pictures. I ran around both lakes, seeing lots of geese and a few rabbits, before heading uphill back towards town. Here my legs just felt really tired so I had a bit of a walk and a stretch before carrying on. I took a photo when I finished, as recently Strava seems to take off a bit of the distance, so if my watch says 10 miles, sometimes when I download it, it says 9.8 miles. Not sure how, but as it was a virtual race and it was meant to be 10 miles, I wanted to have some proof! This one was fine though, so I have sent off my Strava screenshot and shall await the medal. After this I had some jobs to do at home, and then we walked into town to see Finding Dory (which I really enjoyed)- the local cinema has gone up even more in my estimation because it is no longer a new release, tickets were less than £5 each! I didn’t have a big lunch because I had eaten breakfast so late, so in the cinema I suddenly felt very hungry indeed, so we bought some peanut M&M’s- we never normally buy food in the cinema and hardly ever eat during a film, but we figured seeing as the tickets were so cheap it wasn’t too expensive overall. Today I headed out on a run first thing before we finished our packing- I explored a new road and have found a new loop of just over 4 miles. All the runs seem to end up going uphill though- our house seems fairly high up- good for when it floods, not so good for running! I was having a look on my phone when I got back and on facebook I am in a “New parkrun” group- and literally as I was on there, they posted the brand new page for parkrun Canada! This is so exciting, as that is where we are going! There are two about to start- one in August and one in September, and this one is actually a place we are visiting. But sadly we won’t be there on a Saturday, so I can’t add another country to my tourism list just yet. Right, I am off to finish packing. Are you enjoying the Olympics? I really enjoy seeing sports I would not normally see (like the kayaking, or gymnastics), but the time difference has made it not quite so easy to watch. I keep getting reminders on my facebook feed from London 2012. The other day I watched a documentary on i-player about the London opening ceremony, which was just so interesting. I had no idea that all of the dancers and performers were volunteers (it was a bit of the parkrun spirit I think) and as well as being interesting it was just brilliant as it brought back all of those fantastic memories. This popped up today! That is my excited face as we were watching the 200m qualifiers so got to see Bolt and all the other sprinters square up to the cameras. Oooh! Glad you sorted the Garmin thing. I’ve got two cables – one at work and one at home (because otherwise, nothing would ever get uploaded. I seem to have become laptop averse at home since getting a mac for work).